Mice have tails longer than their bodies. 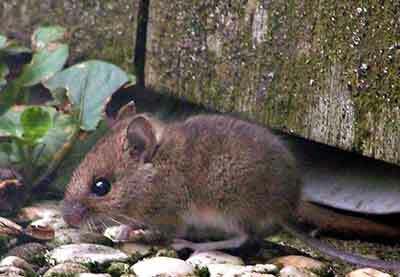 The head of a vole has a round appearance whereas the mouse head is longer and pointier. They both love apples, bulbs, corms, strawberries and newly planted seeds, particularly peas, beans and sweet corn. They also enjoy a nibble on newly germinated seedlings. Active all year round, they have around five litters between spring and autumn. These rodents are hunted by cats, foxes and birds of prey, all of which either live in or visit Warriston, so there is little need to lay poison or traps which may have a detrimental effect on other animals, particularly those predators and birds. If there is an increase in the mouse population on your plot, this is usually a short-lived affair, with numbers falling back to normal sustainable levels naturally. Clearing away debris and cluttered corners can reduce the number of potential mouse homes you have on offer.